Call today for current specials for event rentals & more! Are you looking for a rental store for the party supplies you need for your big event? AAA Rentals is Beaumont's premier event rentals store. We strive to make your event our top priority! Planning a birthday party and need party supplies? Organizing a graduation party and need rental tables? Having an outdoor barbeque celebration and need tent rentals to keep your guests in the shade? No matter what your event rental needs are, AAA Rentals is the number one rental store in Beaumont! At AAA Rentals, you will find all of your wedding rentals, party supplies, event supplies and event rentals all in one place! We offer state of the art options that will make your event a big success! Whether you are planning a quiet outdoor wedding or back yard birthday bash, we are your full service Special Event & Party Rental provider supplying everything you need from start to finish including tent rentals, rental tables and all your wedding rentals needs! Our rental store offers tent rentals for any event! Pole tent tarps are supported in the air by center poles in the middle of the tent. The legs around the perimeter of the tent are spaced out about every 5 feet apart. On a frame tent, the tarp of the tent is supported by a frame that is built on the ground first then lifted into the air. There are no poles in the middle of the tent. Planning a party? If you are looking for a rental store where you can get all your party supplies from, we have got you covered. We carry rental supplies for weddings, parties, and other events. We serve clients in Beaumont and the surrounding areas. We have tents, tables, chairs, lighting, and other items. We'll make sure that your party is a hit with our top-notch party supplies. Contact our rental store for more information about our products. The legs around the perimeter of the tent are separated by at least 10 feet. Both tents MUST be staked into the ground, but a frame tent can be held down with Water Barrels at each leg (costing $15 each). Sides can be added to either type of tent (at only $0.50 a running foot or solid walls). You can also get half clear sides for either type of tent ($2.50 per foot). String lights (bulbs on extension cords) can be put in either tent. 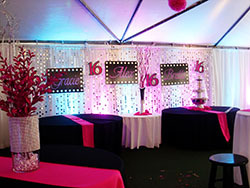 Chandeliers can be hung inside of the frame tent. Lights are $35.00 and we are not responsible for providing the electricity. Liner packages can be added to Frame Tents. 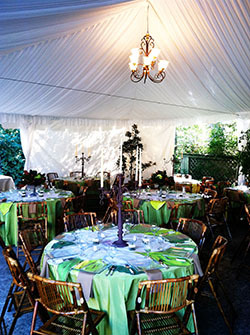 The package includes the inside liner, leg drapes, and chandeliers – perfect for that special event! To find the price of the liner package you would double the price of the size frame tent you are renting. Our rental store is your one-stop-shop for all your party needs! Remember, schedule your event with us as soon as possible to reserve your event rentals. We allow you to make changes to your orders up to 1 week prior to your delivery/pickup date. Delivery is available on certain products or with a certain dollar amount. Delivery prices depend on location. All prices are subject to change. see store for details. Rental store proudly serving the Beaumont area with event rentals and rental supplies. We invite you to visit our event rentals showroom. 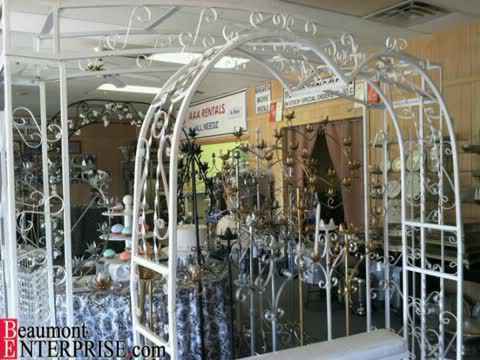 Our rental store showroom is open Monday – Friday 8:00 a.m. to 5:00 p.m.
AAA Rentals / AAA Party Supply, Inc.